Shiv he Sataya, Shiv he Braham, Shiva he Tathya, Shiv he Brahmand, Shiv he adi-Guru, Shiv he Akhand, Shiv he Shakti- Shiv he shiv. I salute the merciful Bhava (i.e. Shiva), and his consort Sati, Adorned with the necklace of the serpent. The Essence of Worldly Existence, Whose Garland is the King of Serpents, Always Dwelling inside the Lotus of the Heart. I Bow to Shiva and Shakti Together. Mahashivaratri (the great night of Shiva) falls on the fourteenth day of the dark fortnight of -Magha-Phalguna (February- March), and is dedicated to the worship of Lord Shiva. 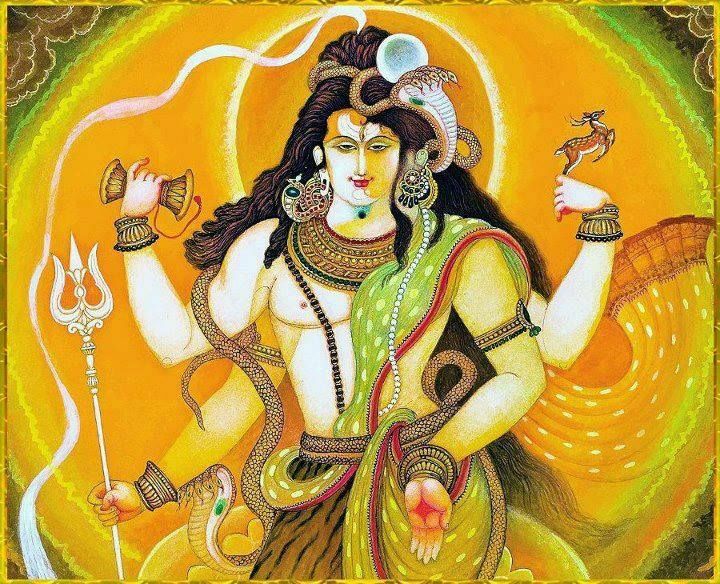 On this day devotees sing bhajans in honor of Shiva, recite Sanskrit shlokas (verses) from scriptures, offer prayers in the morning and evening, observing fasting throughout the day. Offering Bilva leaves to Shiva on Shivaratri is considered very auspicious by his devotees. Maha-Shiv Ratri Purpose is to achieve eternal peace and happiness by worshipping Shiva at night, by meditating on one’s own self during the night when the individual is free from the distractions of the physical world. When the individual attains self-knowledge, he or she can live in the world without being affected by anger, greed, and selfishness, the three enemies of one’s soul. Shiva-ratri symbolizes the worship of the atman within. According to vedic astrological system, Mahashivaratri is considered as one such day when spritual energy in nature is too high to connect with the divine shiva to achieve spritual growth for the higher transformation. It is conducive to spiritual growth and meditation. Meditation helps to reach at a point when we can experience space of nothingness and love. This experience takes us to the level of higher consciousness, that stage only a siddh yogi achieve via going into depeest state of meditation, that is called state of the Shiva- The Adhi-Yogi (The One).Shivratri is that night which is meant for spiritual seekers for connecting with the divine Nature. Mahashivratri is the day when the Shiva Tattva (Guru Tattva- Akash – Eternal Knowledge – Braham) is believed to come in contact with the divine earth (Prakarti- Shakti – Prithvi Tattva – Material). It is believed that during divine night of Maha-Shivratri our higher consciousness, aura, increases ten inches above the material ground or expands in a wide spritual plane. Our Chakaras get align with the nature energy and a sadhak can reaches to the height of Higher chakra – the chakra of One – OM. On this day, consciousness descends and touches the Prithvi Tattva. That is why Mahashivratri is celebrated across the universe – it is the day of wedding of Shiva and Shakti (the Twin Particle of Prithvi and Aakash Tattva) the material world (Earth) with the spiritual world ( Brahmand). the evil elements of the society. family called the Pandavas and their cousins, the Kauravas. dialogue between Krishna and his disciple Arjuna, which is called Bhagavad Gita. Vishnu, who assured Him that He would soon be born on earth to annihilate tyrannical forces. sister, he declared that he himself would drive the chariot to Vasudeva’s house. heavens. It informed Kamsa that Devaki’s eighth child would be his slayer. sister. Afraid of the ill intentions of Kamsa, Vasudeva pleaded with him not to kill Devaki. 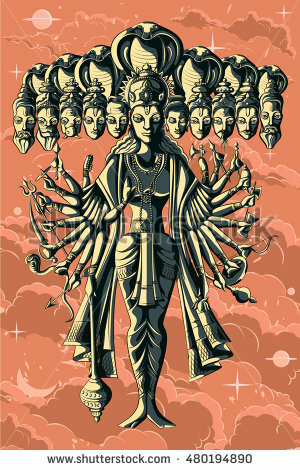 the first seven children of Devaki and Vasudeva, all of whom were boys. to Gokul and coming back to the prison with Nanda’s daughter. It was raining heavily and Vasudeva had to cross the river Yamuna to reach Gokul. The river was in full spate. Vasudeva took a bamboo basket and placed his son in it. baby against the torrential rain! snake protected the girl, just as it had Krishna. child beside Devaki, they informed Kamsa. her against the wall but this time a miracle happened. the angry and dumbstruck Kamsa. seen such a lovely child before. 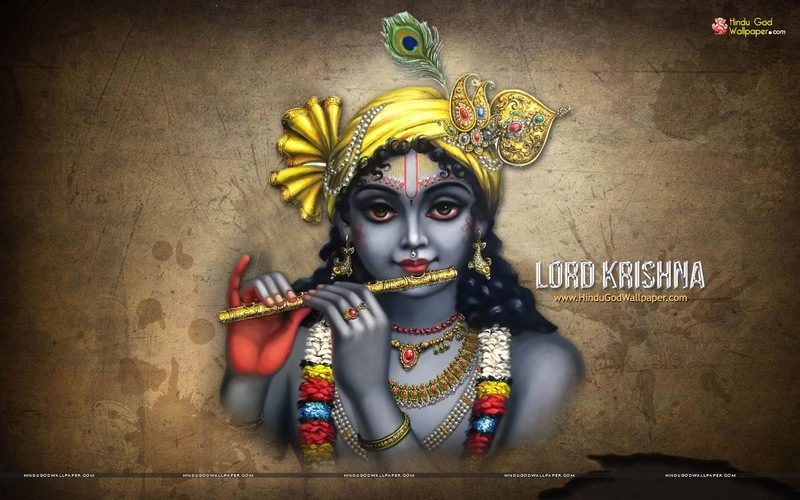 Every year, we celebrate a festival the day Lord Krishna was born, called Krishnashtami. 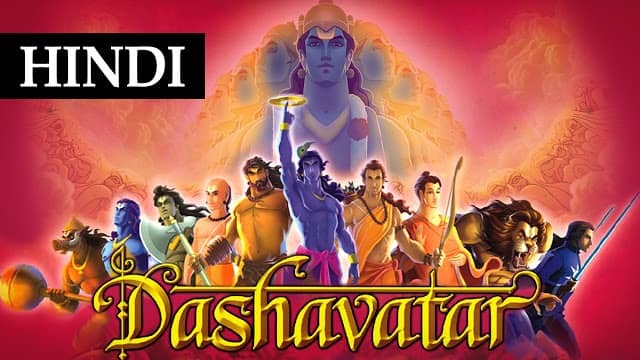 The story of Lord Krishna Around 5000 years ago, King Ugrasen ruled the small Indian village of Mathura. He was loved by all of his people, and raised two very fine children, Kans and Devki. As his children grew older, they both went their own ways. Kans jailed his father, and was the new King of Mathura. He still loved his sister, Devki, with a lot of heart, and got her married to an army officer, called Vasudev. On the day of their wedding, Kans found out that Devki’s eighth child would be born to kill him. For that reason, he though it would be wise to kill his sister Devki. Vasudev was very dear to Devki, and would not let this happen. They then came to an agreement that Kans will prison them, and let them live. But, they have to hand every child to Kans, so it can be killed. Kans had succeeded in killing all of Devki’s six children, and her seventh child, was transferred into Rohini’s womb. Being the second wife of Vasudev, Balram was then born to her, and Kans was fooled into thinking that Devki had a miscarriage. Krishna, being the eighth child, was born on a stormy night in that same prison. As the guards fell asleep, the gates of the prison opened freeing the family. Vasudev hid Krishna in a basket covered with a blanket and made their way to Gokul, where his friend Nand lived. While passing River Yamuna, the waters had turned wild. As Krishna’s foot touched the waters, the river parted making it easier for Vasudev to pass through. At that moment, Vasudev realized that Krishna was not a normal child but a divine human being. 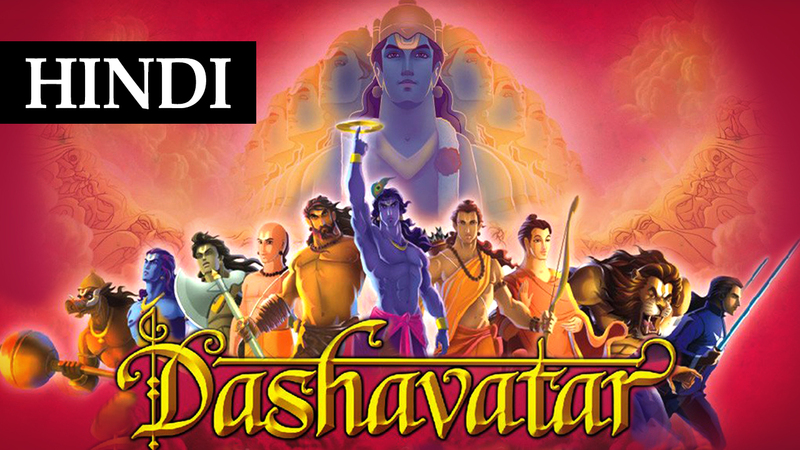 Nand & Yashoda became Krishna’s foster parents and Vasudev returned to the jail with Yashoda’s newborn daughter. She was then passed to Kans, to be killed as the eighth child of Devki. However, while taking this daughter by the legs, ready to end her life. She disappeared into thin air, being just an illusion and leaving a message that ‘the eighth child was born and is safe in Gokul’. 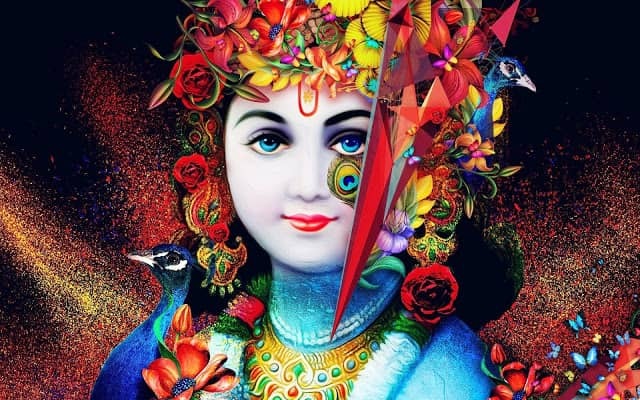 Krishna grew up to be the son of Nand and Yashoda, and as destiny had predicted, he killed his uncle Kans, and all of Mathura was saved from his rule. Janmastami By Ami Gadhia Janmastami the festival Janmastami comes 8 days after the full moon of the Shravan month and it celebrates the birth of Lord Krishna. Many devotees begin fasting from ‘Sataam’ till the midnight of Krishna’s birth, where it is broken by tasting the ‘Prashad’ that was offered to him. There are two types of fasts; Nirjal fast is where they do not even have a drop of water on this day. They feel it will take them closer to God. The other fast is Phalahar Vrat, where only milk and fruits is eaten on this day. Salt and Cereals is also avoided on this day. People feel that it is the only thing that they can offer to God. Fasting is accompanied by singing bhajans throughout the day. Traditional sweets, made out of milk and butter are also eaten on this day, being one of Krishna’s favorite dishes. “Jhanki” means peeping into ones life. 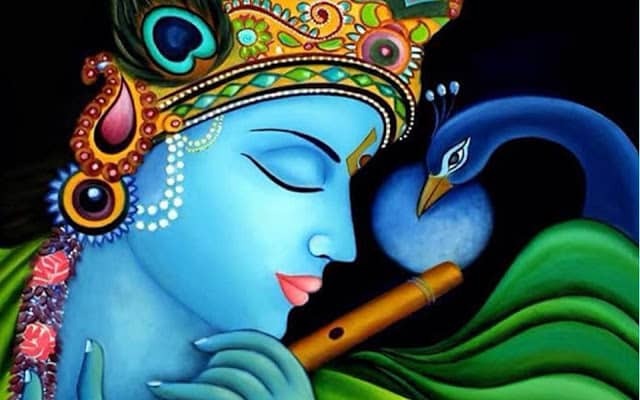 In this case, the moments of Krishna’s life is relived. People or Dolls are dressed up as Krishna, Devki and Vasudev. There are five scenes that are usually reconstructed. These are the birth of Krishna, Vasudev carrying Krishna safely across River Yamuna, His return to jail, the killing of Yashoda’s daughter and Little Krishna in his cradle in Gokul. The people that dress up are not seen as humans at this moment, but a representation of the Lord. The festival of Janmastami can go on for a number of days, as per family tradition. So, on the second day, the ladies usually wake up early to make a paste out of rice flour, and imprint footsteps coming towards their door. This symbolises Krishna’s footsteps into his foster home. The ‘Dahi Handi’ ceremony also takes place later on this day. It consists of a clay pot being filled with milk, dry fruits and ghee, hung up on a rope above the ground. Many form a human pyramid to break the pot, and the people around throw water on them, trying to stop them. Many believe that a broken piece from this pot will keep away negative powers. The month of February will start with the “Krishna paksha phase of Moon”, and it reactivates again the partial ” KAAL AMRITA YOG “, a planetary formation when all the planets will be under the tight grip of shadow planets Rahu and Ketu. The lunar eclipse in Ashlesha nakshatra and in the sign of Cancer on 31st January is a highly charged eclipse. Many of you must have been feeling the dramatic shift of planetary energies a week before this highly charged full moon.This waning phase will last till partial solar eclipse when new moon will join Sun in the sign of Aquarius on 15th of February. The period between the two eclipses is a very sensitive period.Its a period of dramatic and radical shifts in our consciousness due to sudden and unexpected events taking place around us.Take time out to get yourself indulge in spiritual and religious practices and meditation.These practices will help you align yourself with the cosmic energies well because eclipses darken our consciousness. Don’t get panic at any unexpected issue arising out during these days.Truth will emerge on its own in the days to come.Just have faith that whatever happens happen for a good reason.Chaos will emerge into peace.Just be grounded and be positive. Opposite to the sign of eclipse Cancer, Sun, Mercury and Venus are transiting in the sign of Capricorn and in the highly spiritual and sattvic nakshatra of Shravana.You will feel the transforming energy of this lunar eclipse in the houses owned by Cancer and Capricorn in your natal birth charts . The planet of love, relationship and finances, Venus is sandwiched between Sun and Ketu. Venus is like hemmed between the heat of the authoritative and egoistic Sun and fire of spiritual planet Ketu and is under combustion till 17th of Fabruary. It is signalling a time of transformation in the areas related with Venus that are finances and relationships. Since Sun and Venus are moving towards Ketu so time demands us to inculcate some of the qualities of Ketu in our relationships during this time frame.Better to avoid yeilding authority in relationships otherwise you will loose your position of power. This time demands us to change our old held approach and change our perspective a bit. Handle issue intelligently and in a well composed down to earth manner with a humble approach.When storm comes it is advised to lower our head it saves us from severe injuries. Shravana falls in the sign Capricorn, a natural 10th house of status,power and achievements. Shravana is ruled by the planet Moon.This constellation is related with spiritual attainment and it is connected with Budha who received spiritual enlightment here under the sacred tree “Peepal”. The symbol of this nakshatra is “Ear”and its ruling deity is “Vishnu”.It is the birth star of “Goddess of Saraswati”(Goddess of learning).Primary motivation of this asterm is Artha(wealth) and its tattwa (element) is vayu(air). Capricorn is all about hard work and is practical and goal oriented sign ruled by the planet Saturn.Shravana ‘s lord is Moon.Here Moon’s nourishing nature becomes practical. 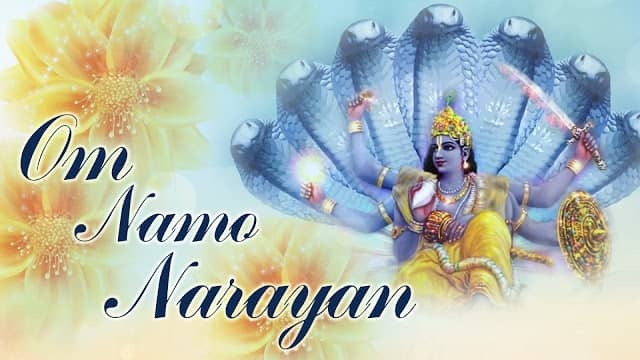 Vishnu is the preserver of this world and listens to the problems of all.This is the inherent nature of this nakshatra.Planets when come into this nakshatra they absorb this energy of listening and preserving the knowladge within themselves to be used later and modify their behaviour accordingly. So apart from spiritualistic side it has a bit materialistic side too. Ketu is a moksha karak planet.Presence of Ketu along with Sun,Mercury and Venus here in shravana is emphasising more on listening and less on speaking.Better to gain knowladge and pay attention to your inner voice to grow and handle issues in your life.Ketu is the co lord of the sign Scorpio where its lord Mars is transiting in the nakshatra of Anuradha , a star of success. Scorpio is a sign of deep investigation and research about hidden realm of your life.Mars gives initiative energy on outer material plane and can work as a best spy here.The co ruler of the sign Scorpio, Ketu helps gain wisdom and helps in inner transformation. So it’s a time of taking a fresh start in solving old issues of your life by gathering information, paying attention to minute details and listening to the outer and inner voices in order to arrive at any definite conclusions and plan your strategy accordingly. Its a time of strategic planned action based on the all the knowladge you gather through listening to the inner as well as outer voices in the areas of relationships about the matters related with the house ruled by Scorpio in your natal chart and these issues will be addressed in the house where sign Capricorn falls in your birth chart. Curb your egoistic and authoritative nature.It won’t help you now. Be humble and adopt mature and practical approach.Ketu negates taking orders from anyone.Both Saturn and Moon are associated with masses so the information you gained through listening and secret investigation can be used to influence masses or people around you. Hardwork along with aligning your energies whole heartedly with the divine energies always pays.Make the best use of this time of Mars transit in Scorpio in the star of success and its co ruler Ketu’s presence in the birth star of Goddess of learning in the sign of Capricorn.Take the initiative and see yourself how divine plan will be manifested and awaken the spiritual warrior within you.Success follows those who sincerely surrender their own will to the will of Almighty. And the best way of surrendering to God is to act as time demands.The planetary shifts are the signals God sends us and only understandable to the one who willfully surrender their freewill and those enlightened pure souls who are His followers. 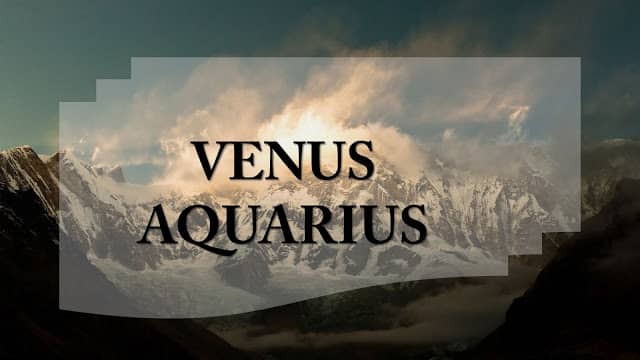 On 6th of February‘ Venus will enter in Aquarius sign, Sun on 13th and Mercury on 15th.All of these planets will be aspected by Mars from Scorpio,Jupiter from Libra and Saturn from Sagitarius. The restrictive energy of Saturn,expansive energy of Jupiter and Energetic and protective energy of Planet of action Mars,all pointing towards a forward looking phase in our life with much hope and positivity in our lives in coming days. 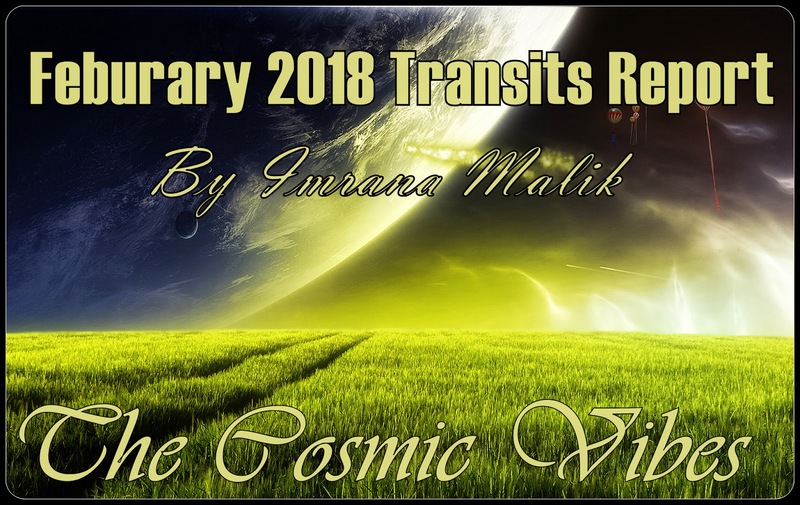 After 19th February, Venus will be out of combustion.You will feel a bit relief in the matters of heart and finances.Plus by the end of this month Saturn too will come to close in its transit period in the dreaded nakshatra of Mula. All you need is to keep a check on the excessive desire nature of Mars as there will be formation of ANGARAK YOG after 21st February till 25th February. As I have mentioned some of its possible implication in my previous post of 16th of January 2018,that this combo can cause disastrous situations.So be cautious in taking any impulsive actions. Note: Always study and compare transits with the planetary positions in your natal birth chart and your on going dashas to see how they will affect you. The planet of karma Saturn has entered in the last pada of Mula nakshatra, in Cancer navamsha and will stay there till 2nd of March 2018. As now we all know that Mula nakshatra falls in the dharmic sign of Sagitarius and is ruled by the planet Ketu.This star is related with deep investigation.Ketu is a moksha karak planet and here in Mula nakshatra deals with the past issues that are mostly secretive in nature or are hidden from our eyes and buried deep, so we have to go deep to find the truth. As it is ruled by the goddess of Kali, who is often depicted as chopping off the heads of the demons, symbolising the need to open our eyes to the ignorant behavior of ours towards life in general, address our core belief systems and moral values and cut our cords with wordly desires that are destructive in nature.So it is a bringer of death and chaos. It will bring out what we can least expect.But this nakshatra is not just associated with destruction and calamities but is a healing nakshatra too. We can heal ourselves here.But as you know nothing comes for free.The price we pay here is usually very high.Enlightment always comes after we have gone through some sort of storms in our lives.These storms clear the way for the change to come. So, get yourself prepared to welcome and embarace the change with the belief that it will be good for you in the long run.Though it will take time to accept the bitter truth/reality that will emerge suddenly. Ketu can act on both lower and higher plane depending upon the functioning of our mind. If functioning on lower plane, can cause confusions and illusions and ultimately we become prone of committing silly mistakes about which we will regret later.But if it is working on higher plane(when we surrender everything to God,s will), it clears all the illusions from our mind and provides us with intuitive wisdom and alleviate us high on spiritual level.Rahu and Ketu are the projectors of our mind.Its up to us how we handle them. Ketu can act like an angel and removes all the illusions if we proceed on the path of moksha, breaking all the chains that keep ourselve engaged in material desires and worldly achievements and can act like a demon if we disregard the spiritual path.It helps its devotees in need in sudden magical ways.Reversal of fortune is related with this nakshatra. The Devta of Ketu is lord Ganesha who is remover of all the obstacles.It is a guardian of Muladhara chakra(base chakra) that resides at the base of spine.Both Ketu and Mula are connected with this chakra.It is very important to get entry past this chakra if you want to move on spiritual path.Kundalini or potential spiritual energy lies here.When kundalini energy is awakened we get access to the power of lord Ganesha. Follow meditative techniques to activate this energy because it will help us on our spiritual journey. Saturn entered in this nakshatra on 26th October,2017, Now it has entered in its last pada of cancer navamsha.The flow of energy has been different in each pada.Things that have been on hold will suddenly be brought to closure.With Ketu everything is sudden and since Saturn is here so enligjtment will come with a very heavy cost.Ketu and Saturn both are separative planets.Mula and Saturn both are linked with air element and Ketu is a fiery planet. Air and fire energy in fiery sign Sagitarius the 9th house of kundali can bring about sad news of mass calamities.Fire and air is explosive. So will get the results quickly.Flow of energy has been different in each pada.But now both Saturn in Mula and Ketu in shravana have joined hands in the navamsha of Cancer.Cancer sign is ruled by Moon. Its a very emotional and sensitive sign.Presence of Ketu and Saturn here will bring out the turbulent side of emotions.Agitated state of Mula will come out here.With Ketu everything is sudden and with Saturn mostly chaotic.Ketu Saturn will bring sudden explosive news that will be emotionally turbulent in nature and will effect our sense of security and emotional stability.We need to control our emotional reactions.Be patient let this phase pass. Rahu is a giver and Ketu is where we get the pain.Rahu is our obsessive mentality and is placed opposite to Saturn/Ketu in navamsha.If we don’t open our eyes to the reality and follow the spiritual path no one will save us from the irreparable loss/pain caused by Rahu. From tomorrow till 13th of february Mars will be vargottam. Vargottam planet gain strength because there is a good flow of energy from soul (navamsha d9) to this lifetime (lagna d1). Mar’s energy in the 8th house of death and calamities aspected by melafic planet Rahu from Cancer can cause sudden chaos.Don’t take any hasty and impulsive action just because you heared any bad news and are feeling insecure.Avoid exercising control on others.Better to control your emotional responses.Don’t over react out of the fear of probable loss. JO HONA HAI HO KER RAHAY GA! !.Just calm your mind and accept whatever comes out.Stop playing control control. Sun will enter in DHANISHTHA nakshatra on 6th of February, a star of abundance,fame,wealth and worldly attainment.It combines the energies of Saturn,Mars and Sun.Sun,s placement here in Capricorn in 10th house of status and power in his friendly nakshatra will give boost to those enlightened souls who have been following Ketu,s path by being humble and modest and adapted well with the energies of shravana from the last month.They will reap the reward now provided they don’t exercise bossy behavior on others and by being egoistic.Let the time put a crown on your head for your patience and wise acts that you showed in difficult time. Mercury is heading toward Ketu.It will bring quick shifts in our thinking with spiritual undertone for those enlightened souls who have been following wholeheartedly cosmic energies for a long time and for others confusion and loss of direction.On mundane level Saturn and Ketu combo in Cancer navamsha,vargottam Mars aspected by Rahu,and Mercury conjuction with Ketu in Shravana nakshatra,media can bring out some secret news or you can hear the news of some mass calamaties around the globe. In short’many will fall from grace and many will rise up.Ketu can do anything.It will be a period of endings for many and start of a new beginning for others.Everyone will reap what they sow.Justice will be done to all. Since Cancer is a feminine sign and is psychic, intuitive, reflective, nurturing and healing in nature so Saturn in this pada can bring out the female healers out of hiding and into the light.Rahu,s placement in Cancer will expose many so called fake gurus too pretending to be spiritual healers.There will be sudden storm in calm water of Cancer.Everyone will get punished or rewarded as per one,s past karma.